Sleep is an important part of our health and livelihood. This is why many people take their bedding choices very seriously. Whether it's cozy flannel sheets or firm, overstuffed pillows, most people have a definite set of preferences when it comes to getting a good night's rest. For those who suffer from allergies, those who just cannot seem to find the right sleeping foundation--or for those who simply find factory-made mattresses to be cost-prohibitive--making a homemade mattress may be a viable alternative. Decide what type of material you'd like to use for the cover of your mattress. Using two flat sheets can help save cutting and measuring time and also can help ensure that your bed will work with both standard-sized bedding and bed frames. However, sheets may not be durable enough for your liking, in which case, you may want to construct two large rectangles from denim, canvas, corduroy or some other heavy-duty material. Sew the pieces together on three sides, leaving a 1-inch seam. Repeat the sewing, moving one quarter inch away from the original stitching, creating a stronger, more durable double seam. Choose the type of material you'd like to use to stuff your mattress. No springs are necessary for a homemade mattress as the amount and type of filling can be easily adjusted until a suitable level of support is achieved. Allergy sufferers should consider foam rubber or latex mattress stuffing while those hoping to recreate the traditional, old-fashioned mattresses might choose straw or feathers. Newer alternatives could include memory foam or shredded clothing or any combination of "soft" items you happen to have on hand. If using loose material, stuff the open end of the sheets until the mattress is full. If using sheets of foam, roll the sheets from the bottom to the top, trimming the foam as necessary to ensure a good fit. Be sure to leave room at the end to allow the edges of the material to overlap. Sew a series of buttons along the open end of the mattress. Cut openings or attach loops to the other side of the sheet, allowing you to open and close the end of the mattress as you see fit. This will enable you to replace the mattress filling if necessary and to remove the cover for laundering. 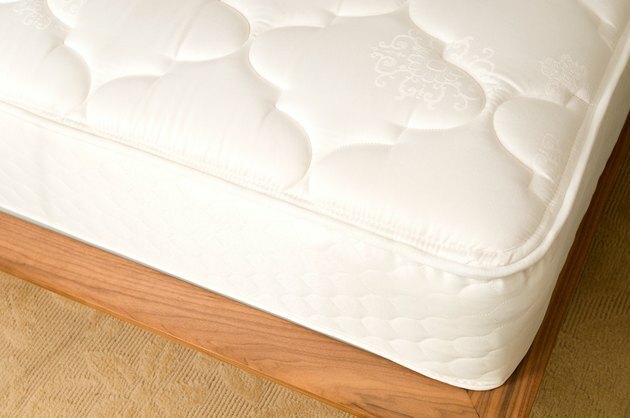 Place the newly made mattress on a flat and stable surface to provide you with adequate lower back support. Remember, many types of mattress fillings will compress over time and with usage. If your mattress seems a bit too large in the beginning, give it time to flatten before removing any of the filling materials.